Direction (1-5): Study the following information carefully and answer the given questions: The given bar graph shows the speeds of stream of three rivers on 6 different days. 1. The speed of still water on day 1 is 18 kmph and the speed of stream of river A travelled certain distance upstream and returned to starting point on day1 in 9 hours. How much total upstream and downstream distance on river A covered on day1? 2. The Chennai to Delhi is a downstream journey on a river C in day2. Boat S and T run a shuttle service between the two cities that are 600km apart. Boat S which starts from Chennai has the still water speed of 50kmph, while boat T which starts from Delhi at the same time has the still water speed 30kmph. When and where will they meet for the second time? Second time meet after 20 hours and 400km apart from Delhi. Second time meet after 10 hours and 200km apart from Chennai. Second time meet after 15 hours and 400km apart from Delhi. Second time meet after 18 hours and 200km apart from Chennai. So, both the boats meets 2nd time, after 20 hours and 400km apart from Delhi. 3. The boat takes 76 hours for travelling downstream from Chennai to Delhi and coming back to Bangalore midway between Chennai and Delhi. If the speed of river B in day6 and the speed of boat in still water is 75% more than that of the speed of river B in day5, what is the distance between Chennai and Delhi? 4. The speed of boat S on day7 is 15kmph and the speed of river A in day7 is average of the speed of river A in day4 and day8. The ratio of the upstream time to downstream time to cover the same distance on day7 is 1:5. If the speed of boat T in still water on day4 and day8 is 12kmph and 18kmph respectively, then how much time will boat T take to cover 90km downstream on day8? 5. The boat S travels 135 km upstream in river B in day3 and return to its starting point and its entire journey time is 6 hours. The downstream speed of boat T in river B in day3 is three-fourth of the speed of boat S in still water. How much time will boat T take to cover same upstream and downstream distances together in same river in day3? 6. Ram, Geeta and Meena can do a work alone in 12, 24 and 16 days respectively. They started working together after ____ days, Meena leaves and the remaining work completed by Ram and Geeta. Total amount is Rs._____ and Geeta and Meena gets equal wage. Which of the following satisfies the two blanks given in the questions? 7. Two bikes A and B start from Delhi and Mumbai towards each other, they take 16 hours and ______ hours to reach Mumbai and Delhi respectively after they meet each other. If bike B speed is 60kmph and then the speed of bike A is______kmph. This not satisfies the given condition. 8. The height of the cylinder is equal to the perimeter of the square whose diagonal is ______m and the radius of the cylinder is equal to the side of the square and the volume of the cylinder is_____. 9. A and B started a business with the investment of A is twice of that invested by B. At the end of _____ months from the start of the business, B doubled his investment. If at the end of the year, the total profit earned is Rs.2800 and then the share of B is Rs_____. 10. A school bus covers a distance from a city to school at the speed of _____kmph and reaches the school 4 minutes late. The next day the bus covers the same distance at the speed of 10kmph and reaches the school 6 minutes early. The distance between the City and School is _____km. 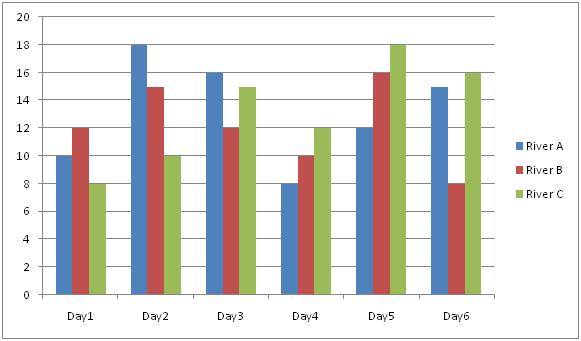 The given bar graph shows the speeds of stream of three rivers on 6 different days. 1) The speed of still water on day 1 is 18 kmph and the speed of stream of river A travelled certain distance upstream and returned to starting point on day1 in 9 hours. How much total upstream and downstream distance on river A covered on day1? 2) The Chennai to Delhi is a downstream journey on a river C in day2. Boat S and T run a shuttle service between the two cities that are 600km apart. Boat S which starts from Chennai has the still water speed of 50kmph, while boat T which starts from Delhi at the same time has the still water speed 30kmph. When and where will they meet for the second time? a) Second time meet after 20 hours and 400km apart from Delhi. b) Second time meet after 10 hours and 200km apart from Chennai. c) Second time meet after 15 hours and 400km apart from Delhi. d) Second time meet after 18 hours and 200km apart from Chennai. 3) The boat takes 76 hours for travelling downstream from Chennai to Delhi and coming back to Bangalore midway between Chennai and Delhi. If the speed of river B in day6 and the speed of boat in still water is 75% more than that of the speed of river B in day5, what is the distance between Chennai and Delhi? 4) The speed of boat S on day7 is 15kmph and the speed of river A in day7 is average of the speed of river A in day4 and day8. The ratio of the upstream time to downstream time to cover the same distance on day7 is 1:5. If the speed of boat T in still water on day4 and day8 is 12kmph and 18kmph respectively, then how much time will boat T take to cover 90km downstream on day8? 5) The boat S travels 135 km upstream in river B in day3 and return to its starting point and its entire journey time is 6 hours. The downstream speed of boat T in river B in day3 is three-fourth of the speed of boat S in still water. How much time will boat T take to cover same upstream and downstream distances together in same river in day3? 6) Ram, Geeta and Meena can do a work alone in 12, 24 and 16 days respectively. They started working together after ____ days, Meena leaves and the remaining work completed by Ram and Geeta. Total amount is Rs._____ and Geeta and Meena gets equal wage. Which of the following satisfies the two blanks given in the questions? 7) Two bikes A and B start from Delhi and Mumbai towards each other, they take 16 hours and ______ hours to reach Mumbai and Delhi respectively after they meet each other. If bike B speed is 60kmph and then the speed of bike A is______kmph. 8) The height of the cylinder is equal to the perimeter of the square whose diagonal is ______m and the radius of the cylinder is equal to the side of the square and the volume of the cylinder is_____. 9) A and B started a business with the investment of A is twice of that invested by B. At the end of _____ months from the start of the business, B doubled his investment. If at the end of the year, the total profit earned is Rs.2800 and then the share of B is Rs_____. 10) A school bus covers a distance from a city to school at the speed of _____kmph and reaches the school 4 minutes late. The next day the bus covers the same distance at the speed of 10kmph and reaches the school 6 minutes early. The distance between the City and School is _____km.